If you want a funny Donald Trump t-shirt then you should check out this Donald Trump Huuuge t-shirt. On the shirt you can see President Trump with his arms wide open and below him you find the text “HUUUGE”. And Trump does say huge a log so this shirt is right on the point and that makes it funny. You can get this President Trump t-shirt in styles for both men and women and it comes in many colors and sizes so that you can have the perfect t-shirt for you and that has to be Huge. Now go fishing while wearing this t-shirt and then you don’t have to tell people how big the fish you caught was because Donald already did that for you on the shirt. 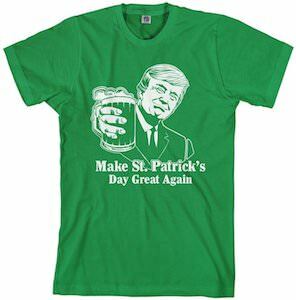 President Donald Trump wants to make St Patrick’s day great again and it all start by wearing this holiday t-shirt. The green men’s t-shirt is available in sizes Small – 3XL and is made from 100% cotton. On the t-shirt you can see Donald Trump holding up a green beer and below the president it says “Make St Patrick’s Day Great Again”. So now you can take Mr. Trump to you St Patrick’s day celebrations and drink a beer with him. 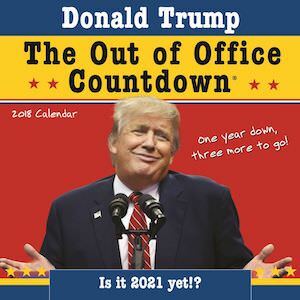 If Donald Trump is not the president of you choice then you may need this 2018 Donald Trump out of office countdown wall calendar. The calendar will tell you exactly how long President Trump has left before his term is done. Besides counting down it also shows some interesting images of Trump. Besides keeping track of how long Trump has left and his images it also has a nice calendar grid with major holidays filled out and plenty of space for you to write down important things. So get a spot on your wall and put this count down calendar so that you and all your friends can see when their could be a new president. If you like Donald Trump or just want presidential things then you should check out this President Trump bobblehead. 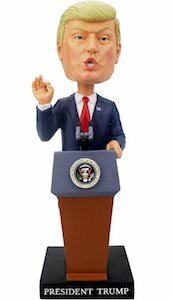 The bobblehead shows Donald J. Trump as he does his inauguration speech and that makes this a must-have collectible as it shows the first minutes of the 45th President of the United States Of America. The President Trump figurine is 8 inches tall and he will move his head every time you want or maybe even if you accidentally kick the table that is on. Sure some people hate Trump and other love him but this figurine also shows the 45th President and that makes it perfect for anyone that love to collect presidential items. If you like swimming and Donald Trump then this women’s Donald Trump swimsuit is what you want. The one piece bathing suit is completely covered in President Trump on both the front and back. You can see the face of Donald Trump taking up the whole front and you can see his eyes are wide open and so is his mouth and maybe it is because of all the people in bathing suits he sees around you at the beach or pool. And this Mr. Trump swimsuit is available in women’s sizes XSmall – 2XL so that many people can enjoy wearing one. Now there is a Donald Trump stress toy that looks like the head of President Trump. 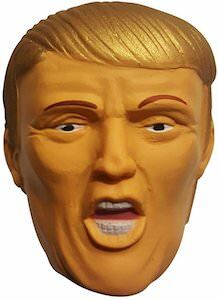 Just have this Trump head lying on your desk and when the stress gets too much just give it a good squeeze and if that does not work then maybe it is time to just throw it against the wall. The Donald Trump head is 3 x 2.5 x 2.5 inch and would be great for the fans and haters of Mr. Trump. Now your day will be so much easier as all the stress is gone after you squeeze the President with all your power. 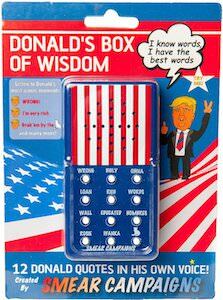 We all know the Donald Trump can say some crazy things sometimes and now you can play those moments over and over again thanks to Donald’s box of wisdom. The box has 12 buttons that all have something that President Trump said and yes it is his real voice. Hear him say things like Wrong, or I’m very rich and there are way more funny and maybe wrong things he says. Having this talking toy is great for making people go crazy especially when you keep playing with it all day long. 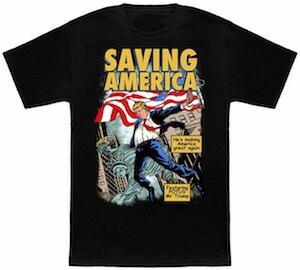 If you believe that President Trump can save America then wear this comic style t-shirt to show your friends. On the t-shirt, you can find Donald Trump flying on a rope with the Statue of Liberty under his arm and the flag flying and above all that it says “Saving America” while on the side there are boxes that say “He is making America great again” and “Featuring Potus Mr Trump”. You can get this cool t-shirt in styles for both men and women and it comes in sizes Small – 6XL and a range of darker colors. 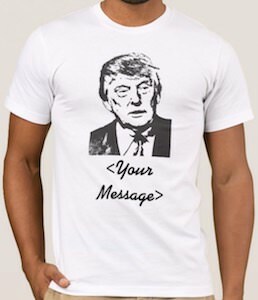 This Donald Trump t-shirt is perfect for anyone as it will have your message below his picture. It does not matter if you love or hate President Trump as the t-shirt just shows the picture of Trump and below it there it will have your message. You can say whatever you want about Donald Trump on this t-shirt and by wearing it the world will know your opinion. The personalized Donald Trump t-shirt is available in styles for both men and women and it is available in many colors and sizes. Now the world will know what you want to say to President Trump as it will be printed on this t-shirt. Love him or hate him! Either way you can not deny the power of Donald Trumps campaign slogan of “Make America Great Again”. 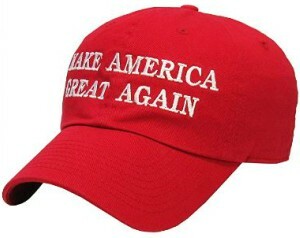 On the front of this hat you will see in nice white embroidered letters the saying of “MAKE AMERICA GREAT AGAIN”. This is the slogan Donald Trump has used for his campaign on the way to his inauguration to be the 45th President of the United States Of America. You can get this hat in 12 different colors and each color features different types of back fasteners from a snap back to an easily adjustable slide. Just pick your color and how you want it to fasten up then you are ready to help President Trump Make America Great Again.